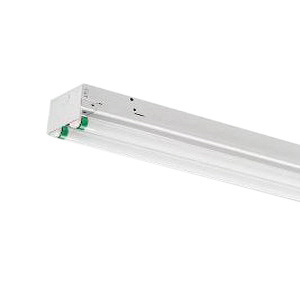 Philips Lighting Daybrite Collection Standard fluorescent strip light in high reflectance baked white enamel finish, features heavy-duty channel of code gauge die-formed steel construction. It accommodates two 32-Watt T8 fluorescent lamps. The lamp has voltage rating of 120 - 277 Volt. The unit/row/surface/suspension mount strip light with THD electronic ballast, has a dimension of 48-Inch x 4.12-Inch x 3.75-Inch. Fluorescent strip light is cULus listed.